Sets the geographic location of the drawing by applying the longitude and latitude to a point in the drawing. Note: This command cannot be used in a unitless drawing; first use the INSUNIT variable to set the units. Enter options, pick a point in the drawing, and then click OK.
To display geographic coordinates, in the status bar right-click the x,y,z coordinates and then choose Geographic. 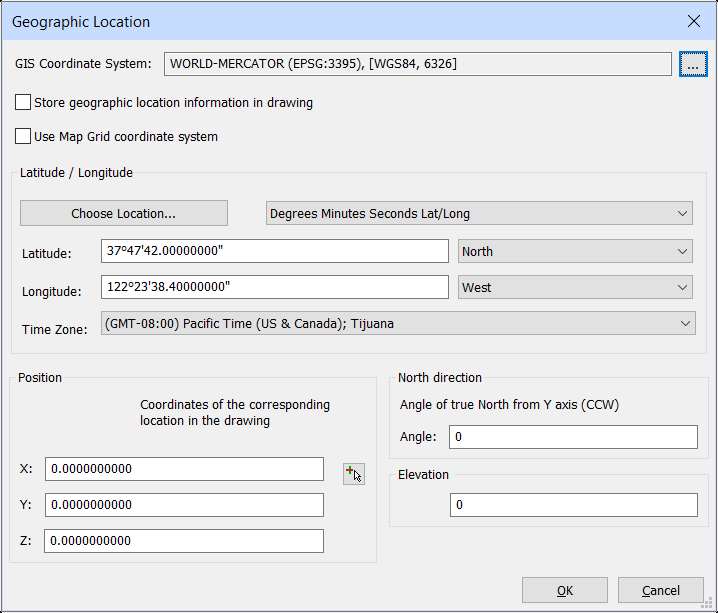 Click Geographic Location System in the status bar to change the way the coordinate system is represented in the drawing. When checked, a red dot indicates the position in the drawing; see Position option. 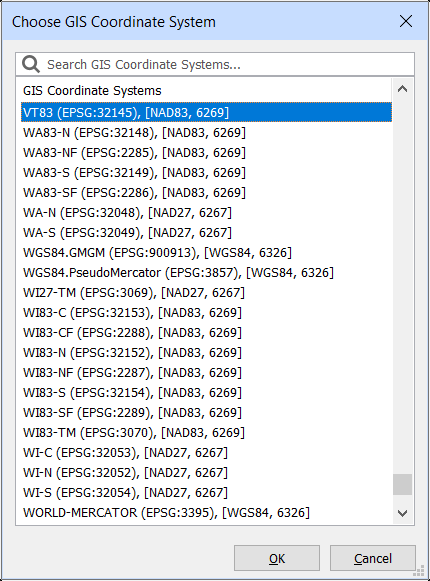 Uses the location data from the GIS Coordinate System, and so grays out all other options in this dialog box. The program asks you if it is okay to change to the new time zone. Click Yes or No. 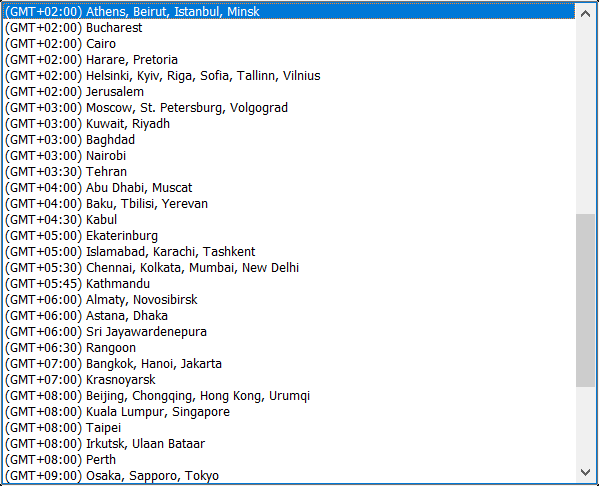 You can also set the time zone independently in the Time Zone droplist; see below. Sets the latitude in either Degrees/Min./Sec. or decimal format. The valid range is 0 to 90. Choose North or South from the latitude option button. The value is saved to the LATITUDE system variable. Sets the longitude of the drawing in either Degrees/Min./Sec. or decimal format. The valid range is 0 to 180. Choose East or West from the longitude option button. The value is saved to the LONGITUDE system variable. The setting is saved to the TIMEZONE system variable. Specifies the angle of the sun from north, in the context of the world coordinate system. The setting is saved to the NORTHDIRECTION system variable. Enter an elevation for the long-lat point; the value can be positive or negative. Render - calculates a photorealistic image of the 3D model. Sunproperties - displays the Sun Properties of the Active Viewport editor in the Drawing Explorer - Lights dialog. 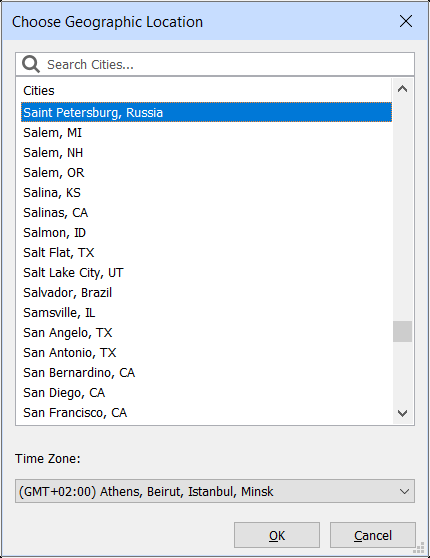 MapConnect - allows to set up a connection with a Web Map Service through a dialog box.